For weeks, everyone seems to have been rounding up the pumpkins already. Autumn will soon take over Instagram. Don’t get me wrong, I’m looking forward to it. The pumpkins haven’t caught my attention just yet though, I’m still gushing over gluts of tomatoes and all the other summer produce down at the greengrocers. 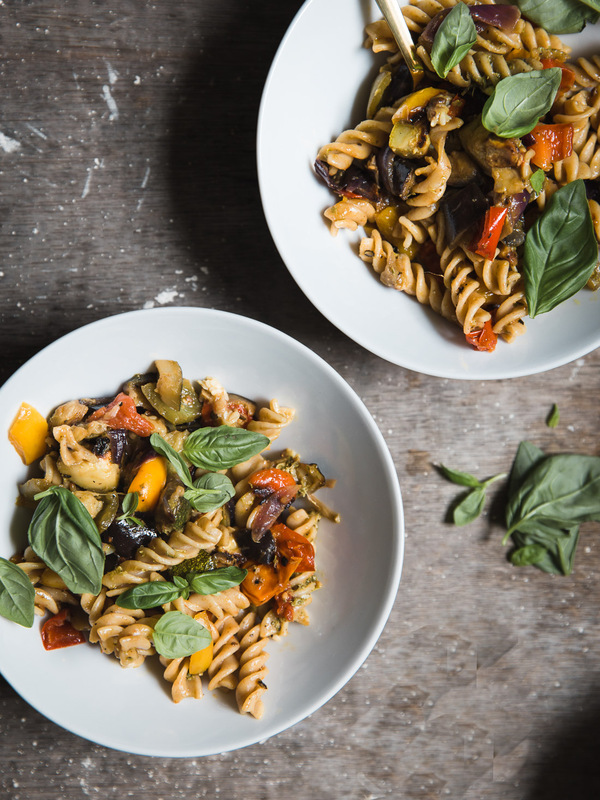 This is a really simple pasta dish for you to make the most of the last of summer. 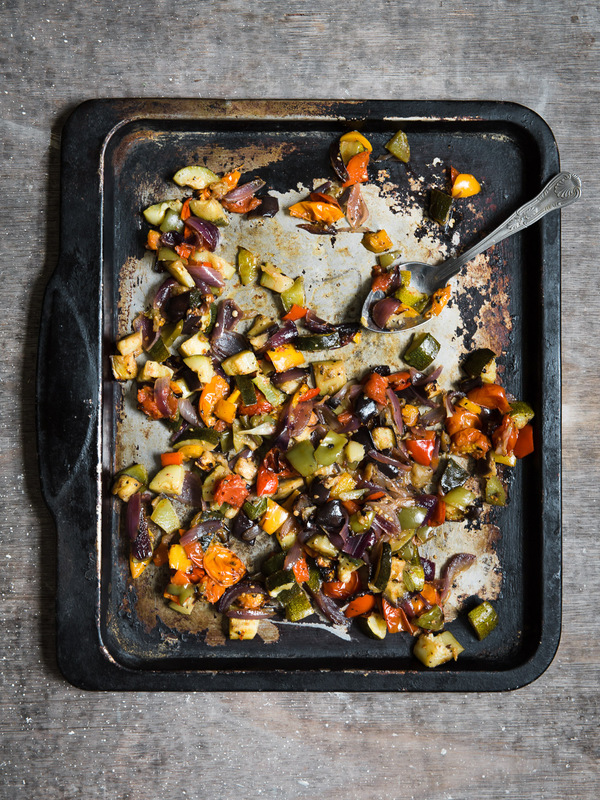 Tomatoes, aubergine, courgette, peppers and red onion roast in the oven with garlic, until sticky and caramelised. A big bowl of pasta is the ultimate comfort dish for me. Comfort food in all its guises has to be the best thing about summer drawing to an end. Maybe, just maybe, I’m ready for the next season now. Heat the oven to 220C/fan 200C/gas 7 and prepare all of the vegetables before placing them in a roasting tin, including the garlic cloves. Drizzle the olive oil over the vegetables and season well. Roast for 20 minutes, take out of the oven to give everything a stir then pop back in to roast for another 20 minutes or until everything begins to char and becomes caramelised on the bottom. Meanwhile, bring a pan of water to the boil and cook pasta according to pack instructions. Drain the pasta and reserve a little of the cooking water. When the vegetables are ready, squeeze the garlic from their cloves and mash into the vegetable mix along with the pesto. Stir the pasta into the vegetables along with a couple of tablespoons of the reserved pasta water, scraping up all the caramelised bits from the bottom of the tray. 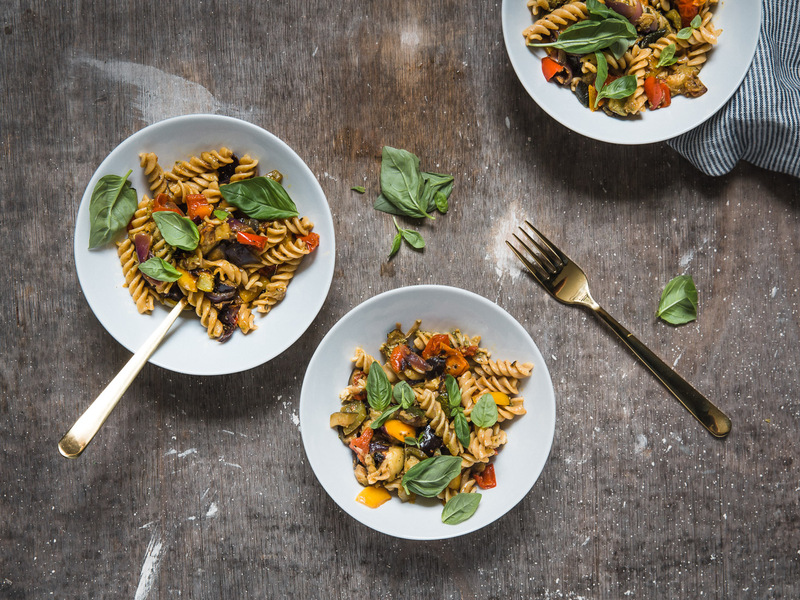 Serve with fresh basil and a grating of parmesan if you fancy.